Came across this interesting Infographic that gives much information on the status of our oceans and how our human practices are contributing to the pollution of the Earth's water resources and affecting the many different species of animals that live in it. 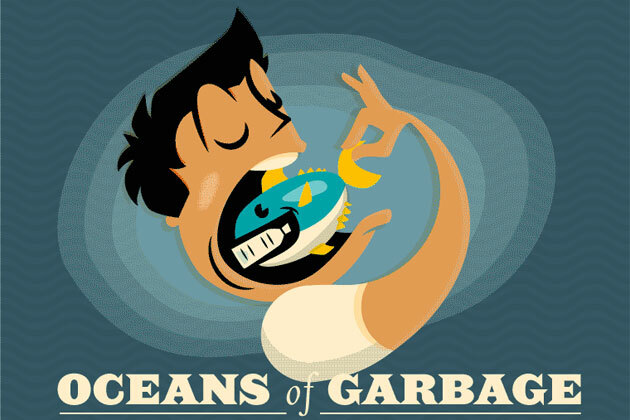 A large amount of the garbage that we produce ends up in the oceans we swim in, feed from and live by. The study raises the concern that garbage, as it works its way through the food chain, could be ingested by humans. By making conscious efforts to reduce our garbage output, recycle and use environmentaly friendly products we can all do our part in protecting this very important natural resourse. The statistics are mostly from the U.S. but it give a clear picture of how everybody on Earth is affected. Some food for thought.